The majority of communication happens around on Facebook and Meetup. 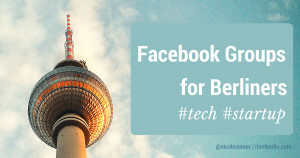 Here is a selection of groups on Facebook, relevant for people working in Berlin. Please help share it and let me know about other relevant groups. Questions which are more for the employee side belong into Berlin StartUp Employees. The main group for event announcements is Berlin Startup Events. de: WG, Zimmer, Wohnung in Berlin gesucht!!! WG Berlin Neugründung: Mitbewohner und Wohnung finden! Is a group missing? Let me know!